A computer algorithm calculated the dynamic shape of the art piece, which covers an area of roughly 700 square meters. Public art performs an essential role in public space because it enhances the creativity of the space and provides it a focus. The variety of public art accessible in public spaces creates vibrancy and becomes instrumental to inclusive spaces which can result in engagement with public art and with people. Laid within a public park in South Korea, this circle-shaped art piece brings together architecture and furniture design, and completely blurs the distinction between the man-made and the natural environment. The installation, which measures 30 meters in diameter, consists of elaborate benches that unundulate to create elevations. It has three types of furniture, set at three different heights: a child’s chair (0.25 meters), an adult’s chair (0.45 meters), and a table (0.075 meters). All these operate for people to lean, sit, or lie down on. The overall structure of the installation looks like the roots of a massive tree, with the benches spread across the terrain. Photographed by Kyungsub Shin. The ‘Root Bench’ accommodates large groups or more intimate company. Its rhythmic form allows it to blend into its setting. Photographed by Kyungsub Shin. The ‘Root Bench,’ which was the winning proposal from the Hangang Art Competition, was designed using a computer algorithm that brought forth the bench’s three-dimensional geometry. This mathematical model, known as reaction-diffusion system, illustrates the change in space and time of the concentration of one or more chemical substances. Sleeved by a wooden deck, it has a metal frame base with concrete footing that supports the overall structure. 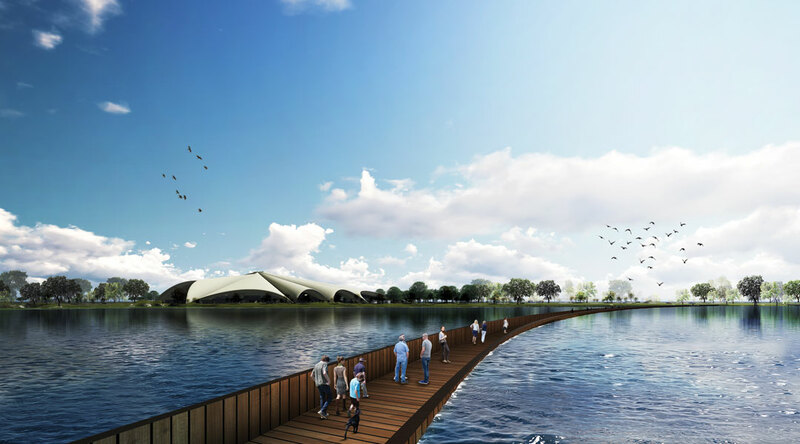 The main concept is to form an organic shape that creates spatial connectivity. 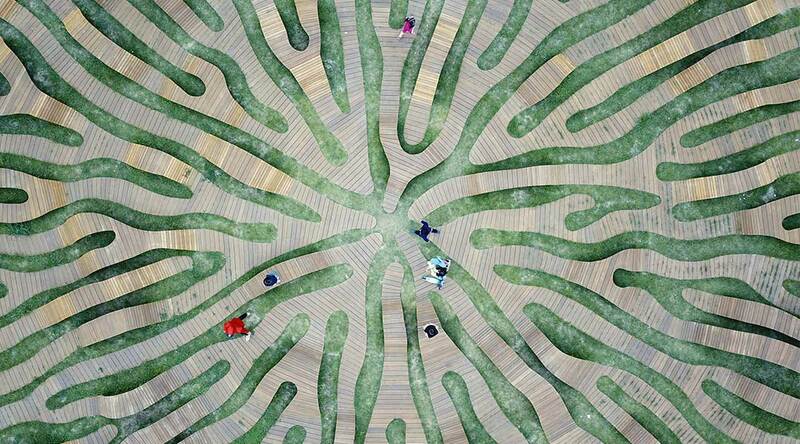 “Root Bench is fused into the grass and blurs the boundary between artificial installation and natural environment,” states Seoul and New York-based Yong Ju Lee Architecture. After dark, lights that are ensconced under some of the upraised roots are switched on, transforming the ingenious piece into an aglow night-installation. “It provides visual stimulus, creating a strong contrast to the background of [the] spacious outdoor park,” continues the firm. The different heights create benches and tables for adults and children. The large-scale installation is located in Ichon-dong, in the Yongsan District of Seoul. Photographed by Kyungsub Shin. According to geographer and urbanist Thejas Jagannath, small-scale or large-scale public art has the faculty to enhance the space of cities. “These kinds of artworks, which are freely available for everyone to interact with either intellectually or physically, can have an effect on the built environment, not only in the beautification of the city or the design of the public spaces, but also on the general public’s psyche,” she says. The ‘Root Bench’ offers a brief glimpse into the terrain of public art in South Korea; it is a kind of utterance that delivers a being-in-the-world. To use public space as a surface for interaction and communication is to create new poetics of urban dwelling, thus, engendering a liberating potential and opportunities for playfulness. Yong Ju Lee’s ‘Root Bench’ not only promotes geometric experiment as a primary creative and aesthetic gesture of building; it also invites people to seek alignment and their own resonant positions relative to the landscape. It is a manifestation of how technology can be utilized to create organic and non-invasive architecture.